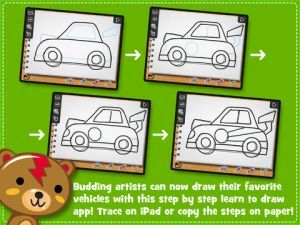 * Learn to draw by tracing over step by step templates. * Very intuitive and easy to use interface. 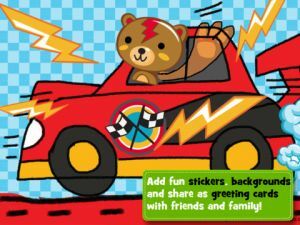 * Friendly audio instructions help kids learn important vocabulary about their favorite vehicles. 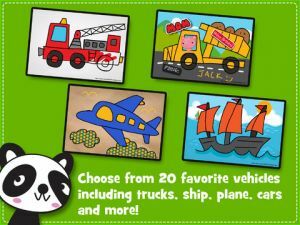 * 20 cute cartoon style vehicles to choose from, such as car, race car, dump truck, cement truck, pick up truck, fire truck, crane truck, helicopter, airplane, fighter jet, ambulance, bicycle, tricycle, motorcycle, train engine, jeep, boat, and ship. * Add fun stickers to the drawing, includes stickers such as �Mom�, �Dad�, �I Love You�, �I Miss You�, �Have Fun� etc. * Ideal for parents who are looking for educational value for their kids beyond blank pages. 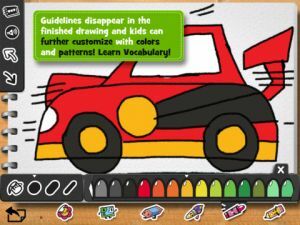 * Kids also learn important vocabulary through friendly audio instructions as they are having fun drawing! * Learning the basics of drawing with many choices compared to any other learn to draw app. 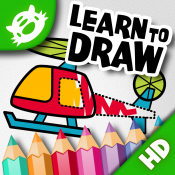 * More coloring, decorating and editing choices than any other learn to draw app! 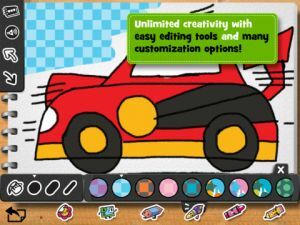 * Lot of features, "learn to draw", "coloring", "decorating with backgrounds and stickers�, "Use as greeting cards" or "Print" to hang on the wall. * Building confidence with drawing and art in any age group! * Art and creativity, right brain thinking. * Basic building blocks of a drawing. * Fine motor skills for younger audience. * Following directions to achieve a goal. * Learn the basic shapes. We have worked meticulously to make sure all the drawing steps are simple enough for everyone to follow and remember. * Does not contain any ads. * Does not have integration with Facebook or other social networks. * Does not contain In App Purchases. * Does not transmit location data. * Does not collect any personal information. * It contains links to the App Store, Rate Now and share by email buttons. Fixed a minor issue about the icon, Saved artwork thumbnails for the iPad retina. iLuv Drawing Animals - Learn how to draw 40 animals step by step. iLuv Drawing Monsters HD - Learn how to draw 20 cute monsters step by step! Practica del grafo y el trazo, adem�s de identificaci�n de formas u objetos, aprendiendo a dibujar veh�culos.